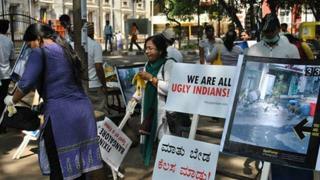 The Ugly Indians have a dare for the nation's cities. "Show us one Indian city that can boast of one kilometre of clean street - with no open garbage dumps, no missing footpath slabs, no urine stench, no paan (betel leaf) stains on walls? Bangalore, we challenge you, is the only Indian city that now has 4km of streets clean from these four civic ills." The Bangaloreans in the Ugly Indians civic group have spent every week of the past year trawling the city's central business district with face masks, gloves, buckets, broomsticks and mops. Their mission is to "spot-fix" Bangalore, dirty street by dirty street, and has inspired the confidence to throw their "Ugliness Challenge" at other cities. They choose small stretches each week to clean: pavements piled up with plastic, defaced walls, footpaths rendered unusable by potholes. The Ugly Indians are mostly professionals in the 25-40 age group and remain strictly anonymous - they respond to media queries only by email. The mission began a year ago to "understand the Indian mind and attitude towards cleanliness" and "outwit him/her with clever solutions". "We didn't call it spot-fixing at first - that name came up as the cricket spot-fixing scandal (in the UK) broke," says one email from the group. At last count, the Ugly Indians had fixed 104 spots - two per week - mostly around Bangalore's central business district, including MG Road, Brigade Road and Church Street. The Ugly Indian page on Facebook has short videos that capture the clean-up in specific stretches - starting with people avoiding the area and then showing the Ugly Indians starting their job, the footpaths and walls as they are transformed by bright paint and motifs, and finally people coming back again. In fact, the group says most people do not even know each others' names - the work takes place silently. Anonymity is a big attraction - many members are fairly senior corporate leaders. Also part of the operation are 150 bins, maintained and cleaned by the group and seven free-to-use WonderLoos - ecofriendly waterless toilets. A trip to the Ugly Indian Treasure Hunt walk on Church Street as part of the anniversary celebration found the toilets fully ventilated, many of them under the shade of trees. Lines of beer drinkers queue to use them at night. The Treasure Hunt was a challenge for anyone to find an ugly spot on the cleaned streets. The Facebook page declared that "Bangalore successfully passed the Inspection Test". Paan was still being spat, but was largely directed at the bins, and vigilant Ugly Indians immediately painted over stains that hit a wall. The work has won the affection of the local constabulary. Basavaraj, a constable at the nearby Cubbon Park police station, said: "These people do first-class work every week. See how clean the road has become. Good people, they don't even give their name." One young, Ugly Indian at work told me: "Anonymity is a hugely successful strategy. Labels take away all the good work. Then it becomes so-and-so's movement. Like Kiran Bedi's or Anna Hazare's. We don't want that. "We don't want to make a big deal about it. We even refused funding because we don't want people to tell us they want their name or logo on it. We want people to take ownership. Which is why they can help by sharing labour, lending skilled masons, painters. Or by sponsoring bins." A local handicrafts shopkeeper, Vishnu Das, also approached me. He said: "This entire road that you are seeing had become a urine point, especially for auto-rickshaw drivers. Unbearable smell. But these people cleaned up this place with their hands. I was so surprised why anyone would do that." Today the stench has been replaced by a pleasant patch of flowers and a mini-garden, adopted by the famous Bishop Cotton Girls School. Nitya and Kirtana, both 22, were among those who had turned up for the Treasure Hunt. The law student and her friend, a kindergarten teacher, had been following the Ugly Indians on Facebook. Walking along MG Road with Ugly Indians picking up rubbish, the two were all praise for the group. "We used to feel terrible on seeing all the muck around. We have even yelled at people who threw stuff out of their car, it just didn't help. As much as it shames us to say this, we wouldn't have done all this cleaning up and on such a scale on our own," says Nitya. So how did their parents react to their support for the street-cleaning campaign? "They were pretty okay with it, but they asked us to clean our rooms first."